Emotional Freedom Techniques, or EFT, breathes fresh air into the emotional therapy process by borrowing from the Chinese meridian system and using a simple two pronged process wherein we (1) mentally “tune in” to specific issues while (2) stimulating certain meridian points on the body by tapping on them with our fingertips. Properly done, EFT appears to balance disturbances in the meridian system and thus often reduces the conventional therapy procedures from months or years down to minutes or hours. Disruption in Subtle Energy: When there is a disruption in the free-flowing energy throughout your body, it gets out of balance and this can manifest into an allergy. Negative Emotions: Negative emotions include fear, phobia, guilt, sadness, anxiety, depression, traumatic memories, stress, and all limiting emotions in careers, sports, business, etc. The way EFT works towards relieving your Rheumatoid Arthritis allergic problems is by re-balancing the disrupted energy system of your body by releasing any negative emotions that are attached with these allergies. Once these emotions are released, your allergies will begin to clear up. Before we begin our EFT tapping for food allergies, take a look at this interesting video ‘Food is Innocent‘ if you are food allergic or food intolerant, which explains better about the idea highlighting emotion-mind association with food and how allergies are developed therefrom. As you get better with EFT tapping, you’ll find that EFT can basically be used for everything and it is also a great technique for eliminating food allergies and sensitivities to things like environmental allergens such as fumes, plants, pollen or pet, bacteria and any substances that your body can react to in a negative way. With EFT, there is only the need for one sequence for tapping away (despite conventional wisdom of TCM which discovers over 300 meridians throughout our whole body). First, it’s best to begin by asking yourself when your RA-related food allergies or intolerance first appears. This often relates to when your Rheumatoid Arthritis began to show up with some symptoms, no matter how mild they can be, say, in the form of a mild pain on your index finger, etc. Then, ask if there are anything traumatic that happened or occurred in your life around THAT period of time, or perhaps, even at times FEW months ahead. Sometimes, the answer can be very simply linked to an experience of trauma that directly connected to that particular allergies. These can be anything, including but not limited to, death of your loved one, unresolved chronic stress, abuse, accident or injuries, vaccination, etc. Experienced practitioner usually advances this discovery work with muscle testing skill in uncovering the underlying causes of one’s health condition. Therefore, if you are continuing your practice with muscle testing, apply the ‘Yes’ or ‘No’ questioning to drill down to your potential causes. Whenever you’re in doubt if the supposed cause in mind is the actual cause, just tap along to clear that emotion. Remember, emotional allergy MUST be cleared for true healing and eliminating the effects of your traumatic event can often result in the end of your allergies. You may apply the above suggested statements but feel free to use whatever statements that feel right for you because everyone has a different, individualized and personalized circumstances. A good way to clear an allergy with EFT is to have the thing you are allergic to, that is, the allergen, physically in your presence (your energy field) while performing tapping. 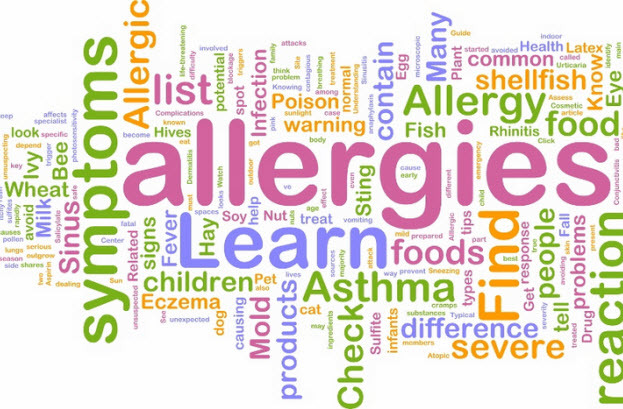 Even though, some people have achieved similar good results by simply imagining the allergen in the head or looking at a picture of the allergen. My personal preference is, so long as you do not have an analphylaxis reaction to that allergen, to keep in direct contact with the substance for clearing with EFT in a glass/vial. Chin (CH) – If I wasn’t allergic to this substance, then what? Feel free to say out loud all and whatever emotions or feelings you are attaching with that allergen. And tap along. As I continue with my emotions…. Do multiple rounds of tapping (sample suggestion for 4 rounds as above – but if you choose to, you may proceed to tap on any emotions that you’ve brought up while you’re performing this exercise). Be gentle with yourself as you tap and test waters. Start off slowly and continue tapping for as long as you feel need to. Video demonstration is a great way of visually guiding and teaching the EFT tapping process. So far, this video is one that I’ve found to be concise in terms of clearing for allergies. Let’s watch this and get tapping. During Dr Gary Craig’s (founder of EFT) discussion and session with LaVonne, he highlights the increasing evidence of intrinsic connection between emotional issue and physical issues that one is experiencing. If one is dealing with a great amount of pain or any physical conditions that cannot be resolved; and despite obvious medical reason why that symptoms are to be there, what damages are seen by doctor and so on, he assumes that emotional contributor is the reason behind that pain, and needs to be cleared. You may need to repeat this process every day for a week to attempt to totally clear this allergy or intolerance. If you fear that you may have an allergy or intolerance to a certain food, you can always start tapping before eating; just put your hand on the plate and tap away. Based on my experience with NAET, or the Nambudripad Allergy Elimination Technique, which is also a branch of energy medicine like EFT that applies TCM’s Meridian approach, it is often always necessary to clear basic items that are necessary for removing burden on our body before treating specific food items. In particular, when our body is so badly affected that it manifests into multiple food allergies, or Leaky Gut that underlies our RA, the clearance of these basic nutrition items is deemed necessary. (This is going to be another lengthy discussion, which I will cover in future posts). A treatment with EFT, while is able to get an allergenic food not to react badly in your body anymore, does not mean that the food is suddenly safe to eat. EFT tapping for elimination of food allergies or intolerance can greatly calm the inflammation, and hence pain, for your RA, but it should not be seen as a path to allow you to eat back junk food or inflammatory diet without consequence. For instance, if you were previously allergic to sugar, you should be able to consume sugar without an unusually adverse reaction after EFT clearing. But being able to eat this something without an allergic reaction is not the same as saying that sugar is a good food to eat. These are entirely two different matters. Using EFT to get rid of allergies can be one of the best things you can do for your health. But once the allergies are gone, please be deliberate with the kind of foods you can now eat. You wouldn’t want to go down that same path that leads you to your RA.